Gold was used as a currency for many centuries. The gold standard-based system of exchange rates called Bretton Woods was established after World War II, but collapsed when Richard Nixon ordered that U.S. dollars would no longer entitle to holders to receive gold. This allowed the U.S. to print money without being limited by their dwindling gold reserves. 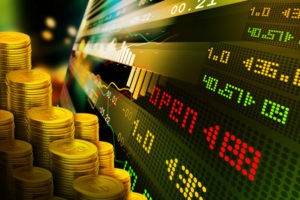 While much of the world has completely abandoned any backing of their currencies by the metal, gold still has a significant effect on the currency markets even today. Whenever there is high inflation, demand for gold goes up. There are two primary reasons for this. First, the supply of gold is limited. There is no central authority governing the supply of gold around the world. Consequently, the supply of gold depends on the demand for gold. This is unlike fiat currencies, whose supply is routinely increased as a matter of policy in order to pay the country’s debt. Since the supply of gold can’t be manipulated in this way, it makes it a great safe haven in times of inflation. As countries increase the supply of money and go into deeper and deeper debt, the higher the tendency that the country’s currency will have an inverse relationship with gold. The second reason why demand for gold goes up during high inflation is because gold has inherent value. It is highly valued for jewelry as well as for industrial uses. Proponents of gold argue that its value has never been zero, and this is true. It is simply too desirable for practical and aesthetic reasons to ever be worthless. The demand for gold also tends to increase whenever monetary supply is increased. For example, when U.S. interest rates are lowered, all other things being equal, there is more borrowing because the rate to do so is lower. This increases the supply of money, reducing the value of it. This will tend to increase the price of gold as more people buy the metal, seeking a better return on their cash reserves or simply reacting to the implications of the interest rate lowering that the market is weak. The Swiss franc (CHF) was only taken off the gold standard in 2000. Until that time, the CHF was considered a safe haven like the gold that backed it. Even though CHF has left the gold standard behind, the currency still holds a reputation as a safe haven due to the political stability of the Swiss nation. If a country imports or exports gold, these can directly affect the value of their currency. This is because imports and exports have a very powerful effect on currency prices. Australia is well-known for their gold production. When the price of gold is high, this adds to the value of the Australian dollar. Australia also holds a significant amount of gold in reserve. The amount of gold held in reserve by a country or central bank no longer has much of an effect on the perceived stability of a currency, since fiat currency is not redeemable for gold as it was in the days of the gold standard. But the reason that it bolsters the Australian dollar is just that they hold an asset, similar to the way a large cash reserve would be viewed as a positive. Since gold is universally acknowledged as a valuable commodity, it is often used to measure the strength of a currency. It is not a simple comparison, however, as the interactions between gold and fiat currencies are complicated. It may seem obvious that gold and fiat currency have an inverse relationship, but this is not always the case. If gold prices rise due to industrial demand, any fiat currency compared to it will appear weaker. In the context of one nation’s currency over time, this can be misleading. Comparing different currencies through their equivalent in gold, however, can provide a different perspective of comparing different fiat currencies. Gold has a significant effect on the Forex market. It can be used as a means to compare two currencies. When inflation rises and when central banks implement decisions that increase the money supply, the price of gold will tend to rise because gold, with its limited supply, is considered a hedge against such conditions. The U.S. dollar and the Australian dollar are the most sensitive currencies to the price of gold. The U.S. dollar has an inverse relationship with gold, due to its debt and its program of printing more money than other countries. The Australian dollar has a positive correlation with the price of gold, because of its gold reserves and due to the fact that it is a net exporter of gold.